A healthy turn out this month from the C.R.A.S.H lads bolstered by another new face on the scene. Rob (Gary’s brother-in-law) who claims to have not ridden since before bike were invented, so is getting used to his Trek Fuel borrowed from his son. Nice one Rob. So the crew line up is as follows: The neighbours, Alex and Craig, then Gary who’s nearly 50 and Rob who isn’t and yours truly. Alex piled in with Gary and Rob to catch up on some needed shut eye, while Craig and I lead the way over to Sedbergh, England’s book town at the foot of the Howgills Fells and the Upper Rawthey Valley. You’ll find the area on the Ordnance Survey Map OL 19. We set off from Washington at 07:30 and arrived there around 09:30 and parked up behind the well kept public toilet in the main street. A quick blast back along the A683 we peel off left down a narrow country lane heading to Thursgill Farm where the climbing starts as the road turns to a well surfaced stony track. Barely giving you much of a warm up we cross our first beck that inevitably drops steeply followed by an equally stiff climb. Gear management was set to be the order of the day as much of this side of the ride at least would see us traverse many waterfalls and becks on this east side of the Howgills. From here we all search for the granny ring up Fawcett Bank making every effort to bag the climb on fresh legs. The weather here was nowhere near as clear as we had left it in the North East. There had been some serious downfalls from the looks of it and we were about to find out how this would shape up the ride. The trails were drenched. On a technical incline we were all dabbing, searching for traction from the little that was on offer. A series of soggy dabs and false starts, trying to get some momentum going to be taken out by a wet angled stone or a devilish root, it was bordering frustration. 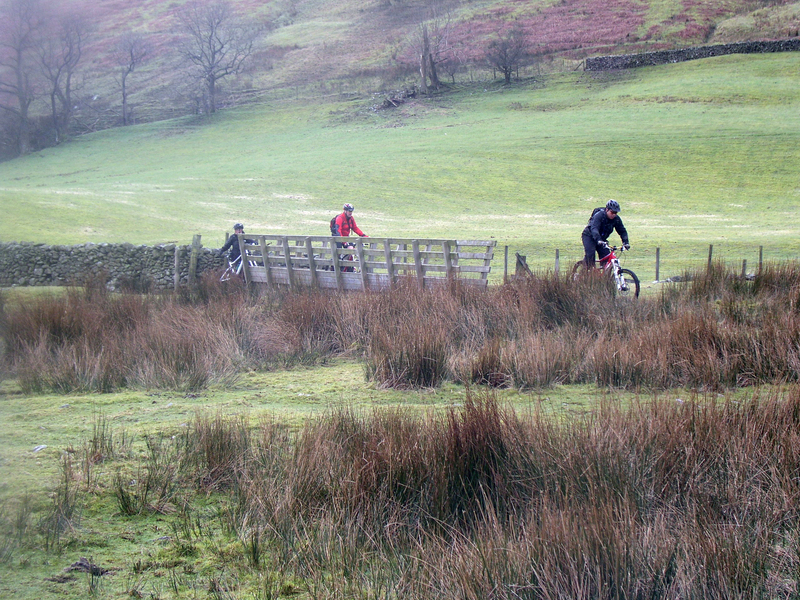 But the frustration soon began to look like a test that we all eventually came to accept as a path for the course for this ride in slippery February conditions. This whole section was a lesson on riding off-camber mud and Alex was about to show me how to stop spectacularly on wet grass. An innocent 180° skid turned into a cartwheel for Alex and a backflip for his bike leaving them both laid out on the grass. Unfortunately I only saw it but didn’t capture his acrobats in quality HD video for your viewing pleasure. I left without the Go Pro today. It would have been off to Harry Hill like a shot. I think only Alex and I were laughing while all others were busy studying the ground for any morsals of grip. 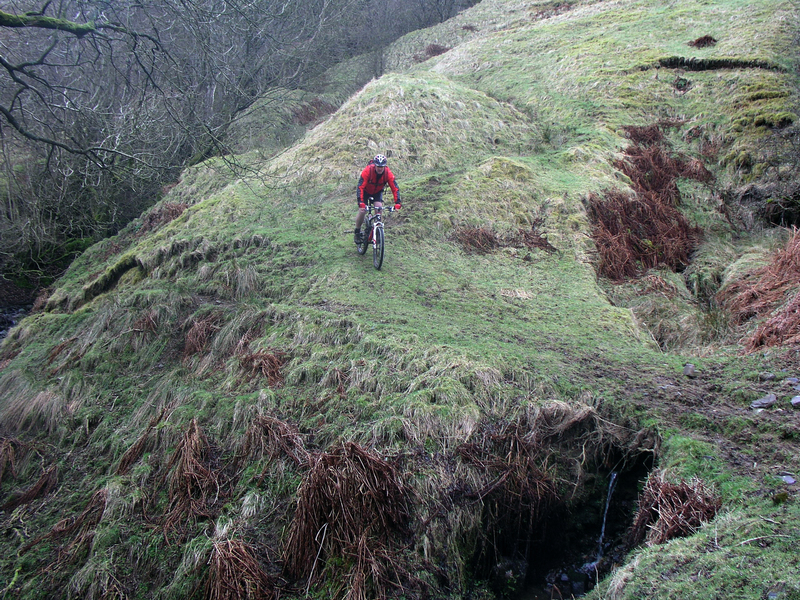 The trail did eventually open out into some cracking flowy single track albeit in short bursts into dips and troughs. Despite the low cloud there was enough to see that we were in fine surroundings as we bunched up at the plains below Cautley Spout. Crossing the footbridge looking out for the stone trails hugging the River Rawthey I was just pleased to be out. 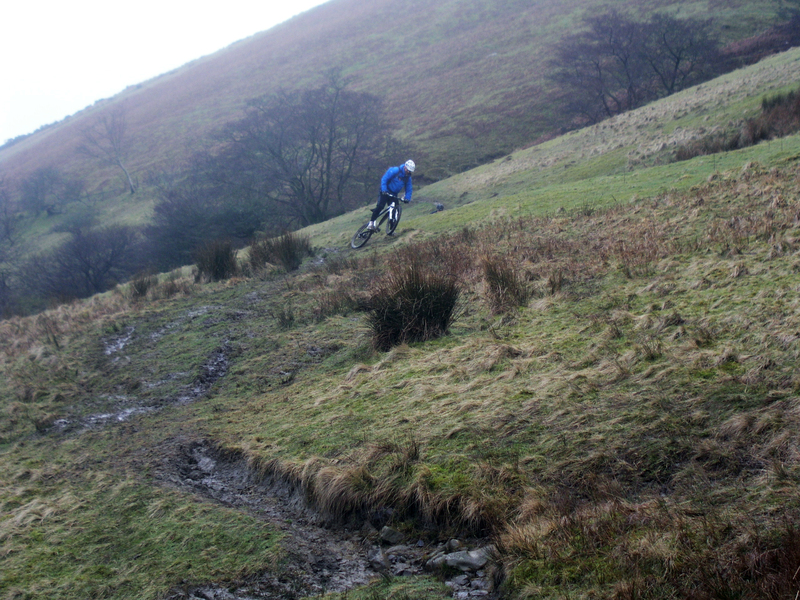 The damp air took nothing away from the enjoyment of messing around and larking about on our bikes getting filthy dirty. Everytime Gary even looks at water he threatens to just get in. This was a regular occurrence last year in Morzine. Today he stood up on the footbridge, arms aloft looking as if he’d throw himself into the beck. On a slightly more temperate day he’d have been in there for sure. We crossed to the River Rawthey onto the A683 again at the Cross Keys and proceed on tarmac on the look out for a bridle-way on the left. To cut a long story short, neither of us could locate a bridle-way squeezed between the road and the river because on closer inspection there was no bridle way. The dashed line that seemed to be in the river was in fact a boundary and not a bridle-way. 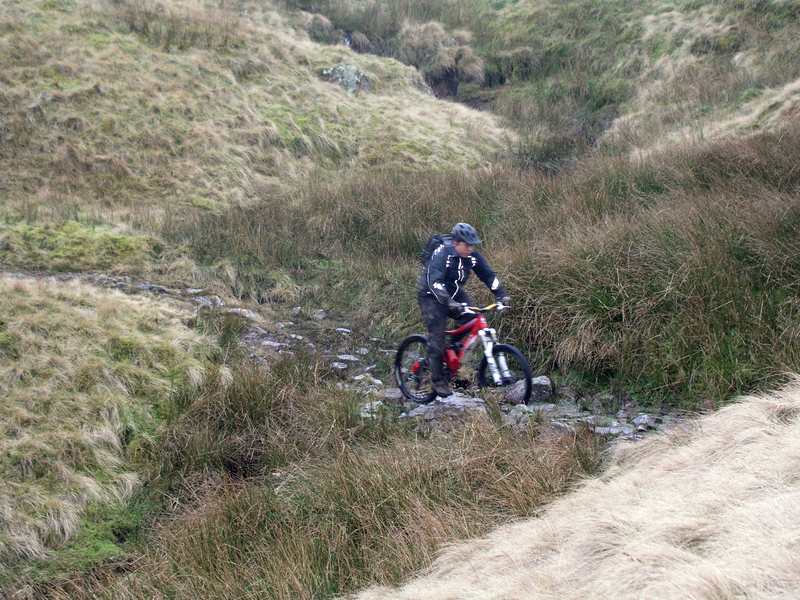 Needless to say we got a bit off the intended route and pressed onwards up steeply to Murthwaite. This steep push a bit ride a bit trail was a good excuse to break out the Soreen and my recent trail snack of choice Banana and Peanut butter wrap. No one was keen to share it. I wasn’t complaining. Our (my) navigational mishap, meant we had to find some way back down onto the road again. The only option was a quick shoot down a footpath to pick up a BW part way down that would spit us out on the road. With no real trail to make out it was each to their own on how they got down. Bums hanging out back to avoid any over the bar bailouts was the obvious approach. We’re spat out onto the A683 finally and look up the road for a BW. However we first negotiate a fast flowing Sally Beck. I think we all managed to get across with relatively dry feet. Though the faintest BW was in such a soft and boggy state this would soon change that. 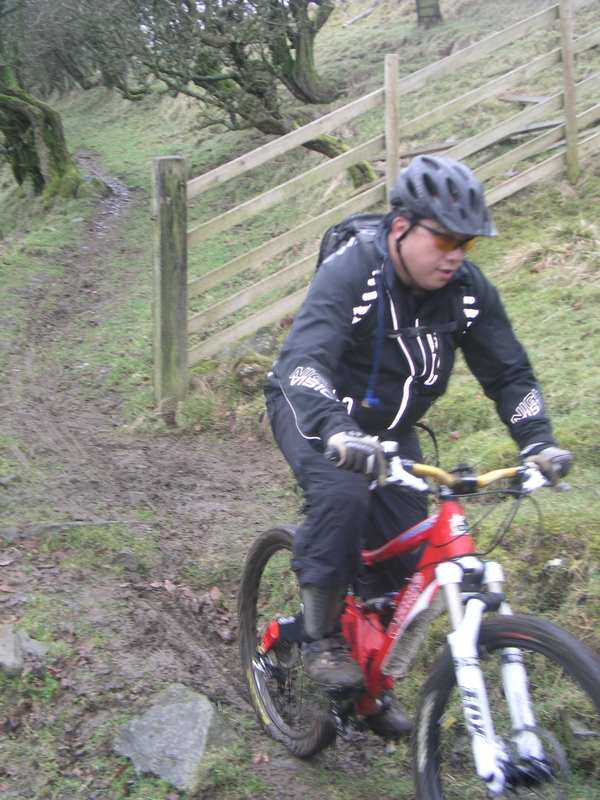 A G.O.A.P stint followed, where I nearly lost a leg in the mud. Alex also to a dive and got an arm full of mud. Gary likened him to Cockle picker,It took me a while to suss the full extent of his humorous observation. Onto the lane leading us to Udale House there was nothing in front of us but the vastness of Baugh Fell. 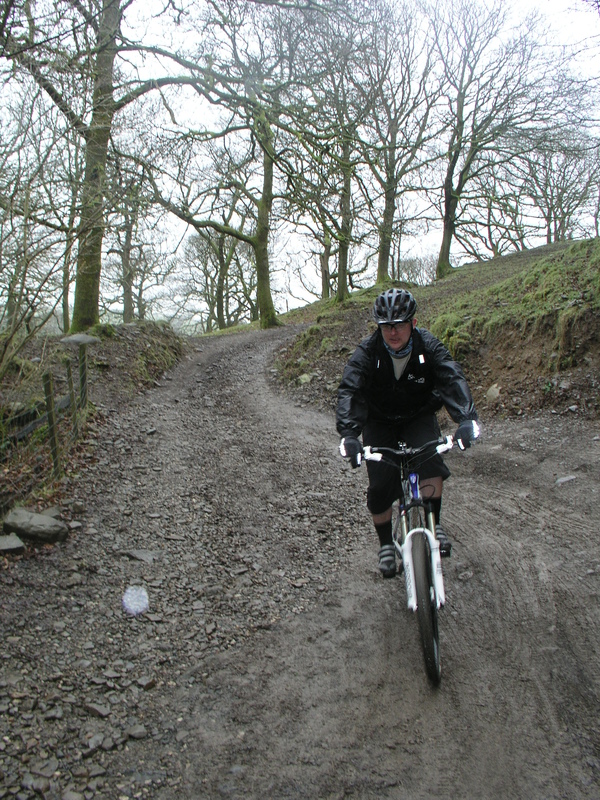 Another short BW signposted Bluecaster (very soft) which looked like a good downhill blast, forced me to make a rapid dismount or risk being buried in the squelchy mulch track. We crossed a bridge over the source of the infant River Rawthey. It was here we or I decided to get a group photo to send to Keith, our absent friend . 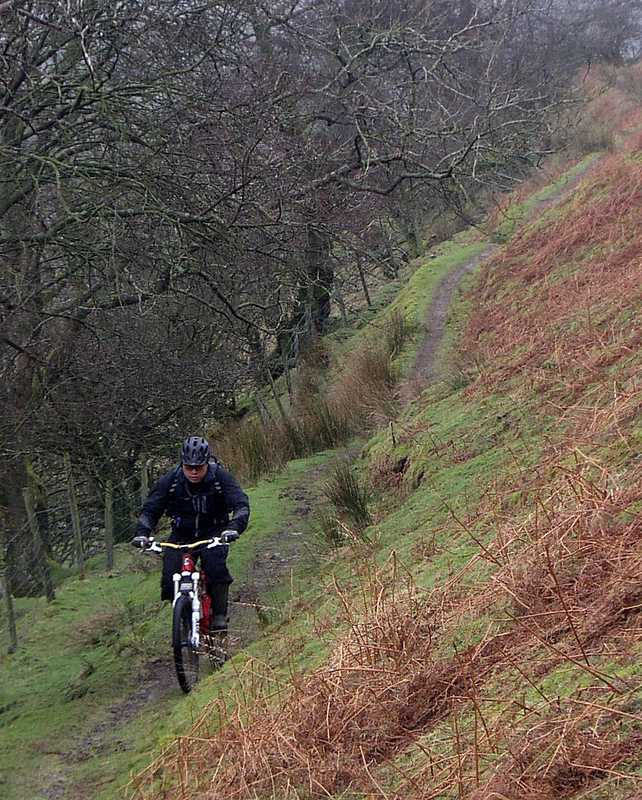 The next section was a moorland ride that skirts Bluecaster. A singletrack crossing dozens of gills. A mix of boggy grass and wet trail that really did drain the legs in parts. This section felt more like a hard training session that I felt was about making it pay for those long summer rides we all have our sights on. Which ever way you look at it we were riding and that’s all that mattered. From here on we got our heads down and made our way down to the road where we would make a dash back to the carpark in Sedberg around 14:45. But before returning home we dropped into the ‘dry pub’ that is the Cross Keys with no beer, ridiculously low ceiling beams for a mid-afternoon lunch and a coffee next to an open fire served by a bloke nearly 7 foot tall. Suitably wiped out we slumped by the range fire. No one felt like moving, dispite the relatively short 16mile ride it felt like we had put in twice the effort. You could have mentioned that Odd Job was a Chinese chef ref: the cockle-picker. Although, you may of started a race political agenda for some sad people sitting behind a desk spouting out equal opportunity & diversity issues. But it would of been worth it!!! I couldn’t give a monkey’s if I start a political row, I don’t want to upset Alex, and I’m no match against a 17 stone but shrinking IP man coming at me with a hot wok. Besides we’re a peaceful lot over here in bike street. Sorry I didn’t get to say my goodbyes after the ride Gaz, I had to get the dinner on before the bread-knife rocked up after a hard day at the office. 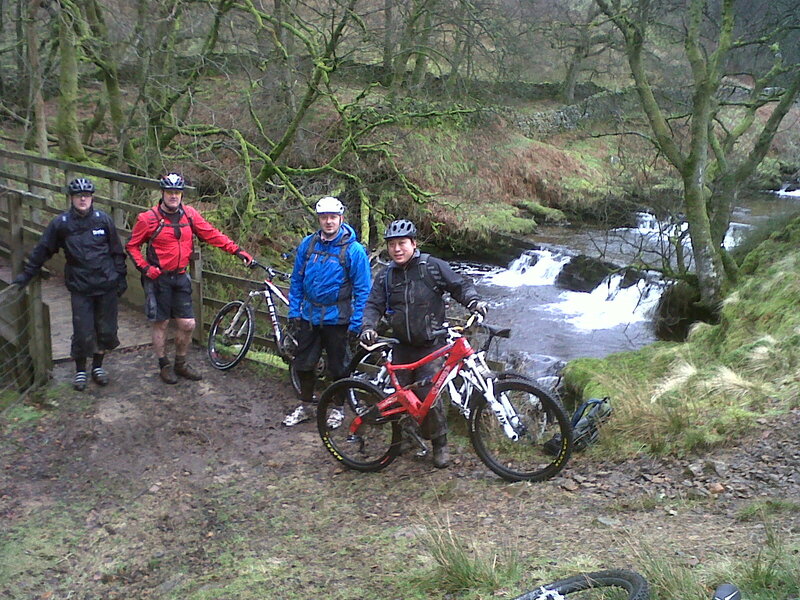 But hope you can make it out on the next ride to Reeth and make sure Rob comes out too. Keith should be turning out as well.